You are here: Home / Reviews / Friedkin and Letts return, but is their second collaboration, Killer Joe, any good? Simon Roger Key went along to a screening at Dartington’s Barn Cinema, to see for himself. This also marks the second collaboration between Friedkin and the American playwright, Tracey Letts, who has again, adapted his own play for the big screen – just as he did with Friedkin’s version of Letts’ other stage play, Bug (Friedkin, 2006). But can lighting strike twice? Calling the Smith Clan dysfunctional is like calling the Adams Family conventional. They are without doubt, one of the most repugnant and stupid film families ever committed to celluloid… or is that digital? Their tale begins when Chris Smith (Emile Hirsch), a young douche-bag if ever there was one, gets in debt with the wrong people and devises a heinous scheme to escape his assured and no doubt grizzly fate. Conveniently, there is a police detective in Dallas, who doubles as a hitman and for $25, 000 he will eliminate whoever he’s asked too. Now, the Smith’s don’t have that sort of money, but Chris knows his mother has a fat insurance policy. So, all they have to do, is convince Joe to kill Chris’ mother in advance, then when the insurance company pays out, everybody gets paid and Chris clears his debt. However, the Smith family are incredibly stupid, and so, things do not go according to plan. 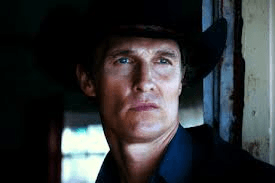 The first thing to say about Killer Joe, is that whilst it is very good, it isn’t quite up to the same standard as the director and writer’s previous collaboration, Bug. However, as with that film, Killer Joe does feature a mesmerizing performance from its star, Matthew Mahogany – not something I thought I’d ever write! But it’s not quite to the same scale of Michael Shannon’s disturbed, Peter Evans. But whilst Bug was about the disintegration of one man’s mind, Killer Joe is a good old-fashioned, Americana pulp affair – it’s a film noir throwback (through and through). Chris is probably our most natural protagonist, but it’s the devilishly charming Joe who we are drawn too. And whilst the Smith clan lack anything which resembles family values, morals or ethics, Joe certainly does. Or to be specific, he follows a regimented code of conduct, his values/ethics -similar to Tom Cruise’s killer in Michael Mann’s Collateral (Mann, 2004). Joe may well be a contract killer, but he won’t be drawn to discuss how he will murder Dottie’s mother, whilst they eat their tuna casserole dinner. However, while Joe might deem himself better than those he manipulates and bullies, he is in fact far worse than the idiots – and they are idiots – that surround him. The film features a now infamous sequence, a scene which involves Hansel’s (Thomas Haydn Church) second wife, Sharla (Gina Gershon), fellating a piece of KFC, until Joe (possibly) blows his load. The scene has been hailed as problematic and it isn’t hard to see why; it’s both demeaning and protracted. The point is made relatively quickly, Joe is really not a nice guy, he’s humiliating Sharla to prove how powerful he is. But there’s really little need for an actress to endure gagging on a chicken bone. It is a repugnant scene and one which quickly outstays its welcome – cries of misogyny are unavoidable. The majority of the film’s characters are “dirty”, in some way or another. The only innocent is Chris’ younger sister, Dottie (Juno Temple). However, she’s brought into derogation by her families’ actions, when they volunteer her as a “retainer” for Joe. Dottie is offered up like a piece of southern fried chicken at a BBQ, and thus, even the most innocent characters in this world, are eventually sullied. Despite the troublesome chicken sequence and the film’s conclusion being signposted fairly early on, Killer Joe is still a very compelling film and with some outstanding acting from everyone involved. This is a vibrant piece of filmmaking, from a filmmaker who has rediscovered his “mojo” and I suspect in part due to his continued pairing with Letts. This is something which clearly isn’t lost upon Friedkin, who almost gives the screen writer equal billing at the film’s beginning – and deservedly so.